Happy Easter everyone! 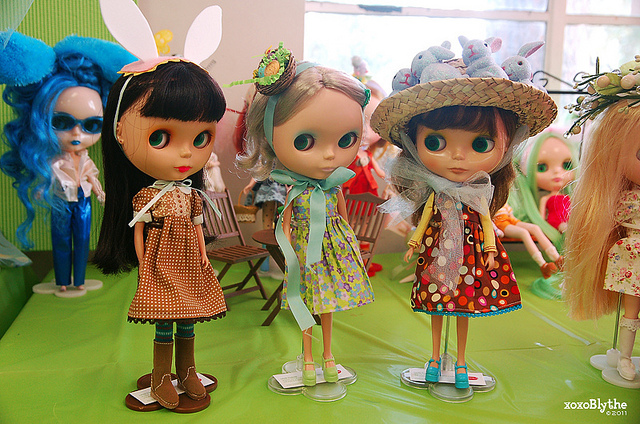 A few girls and I went to the Spring Fling Blythe meet at Verdugo Park in Burbank yesterday and had a great time. The L.A. Blythe folks are so creative and made some amazing dioramas as well as some great spring outfits and bonnets for their girls! As always, there are lots more photos in my Flickr - click on the thumbnails below to see more! Paige, Dru and Taylor went to the meet and came home with some great prizes! Dru is wearing an Easter egg nest bonnet made by Barbara/DollNo9, and Taylor is wearing an Easter bunny hat made by Penny/BlytheGalaxy! 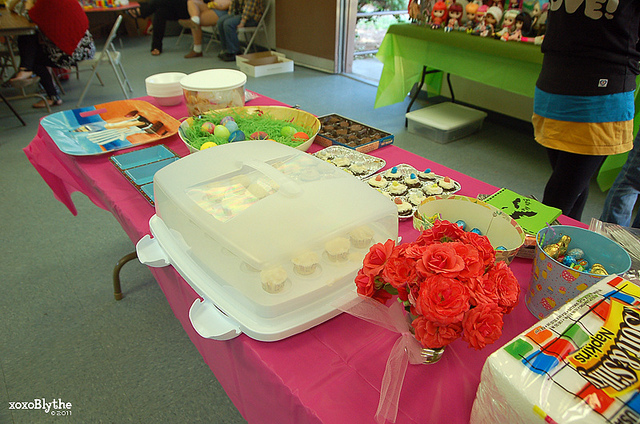 We enjoyed some great mini cupcakes, chocolate, eggs, and we also brought a homemade banana pudding trifle. Thanks L.A. peeps for making the meet another fun one! Ahoy, mateys! 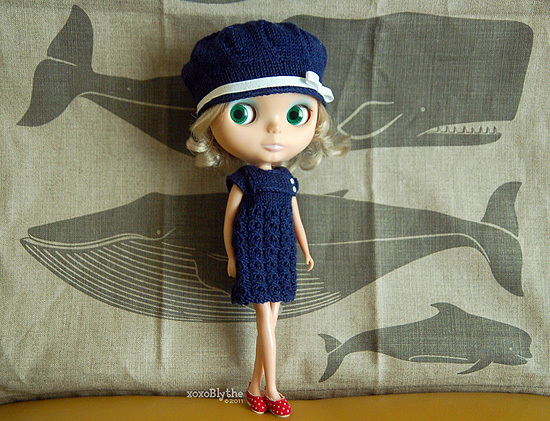 Dru is modeling a set I've just completed, The Little Sailorette knitted hat and dress set, which will be a raffle prize at BlytheCon 2011! I had a lot of fun knitting this set - the dress is of course the style I have been working on for the past few weeks, but the sailor collar took a lot of experimentation and hours of staying up late. I tried several different styles and finally ended up with this one. So glad to finally figure it out as part of the dress! It's just not a sailor dress without the signature collar. And of course, the hat was somewhat of a headache because I worked without a pattern and it took a while to figure out the exact gauge and number of stitches needed. This was actually attempt No. 2. My first attempt was an actual sailor-style hat, which turned out way too big and the style just wasn't quite right. After much research, I decided on a more versatile hat style but with nautical colors, and I am really happy with how it turned out! The yarn used is Spud and Chloe Fine (80% wool + 20% silk), one of my favorite yarns to use for Blythe knitting. I used the color "Snorkel," and knitted it up with size 1 needles. Needless to say, the hat took FOREVER! I always forget how big Blythe's head is compared to the rest of her. LOL! 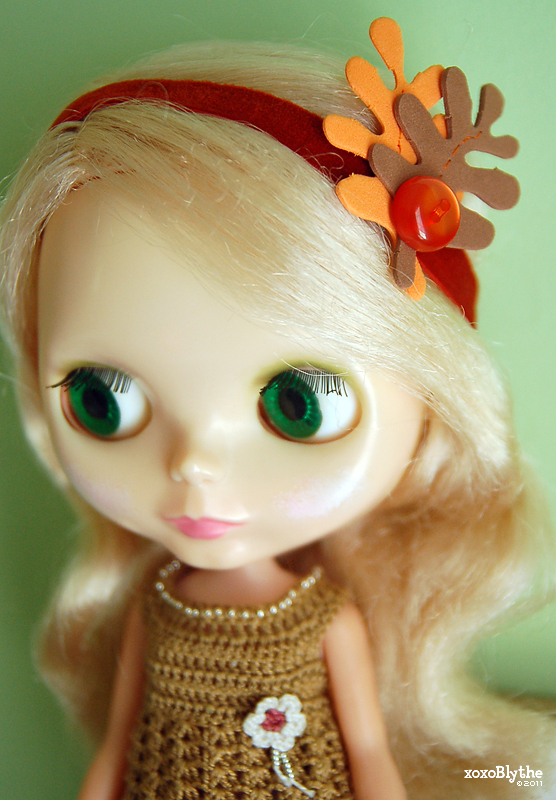 I am really proud of this little set and I can't wait to see who will get to take it home at BlytheCon 2011! 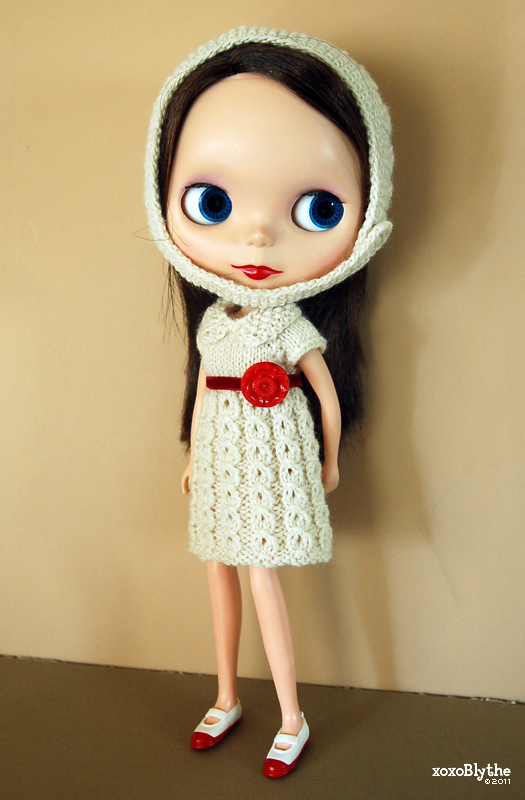 xoxo, Blythe is proud to present a hand-knitted outfit set: Red and White. 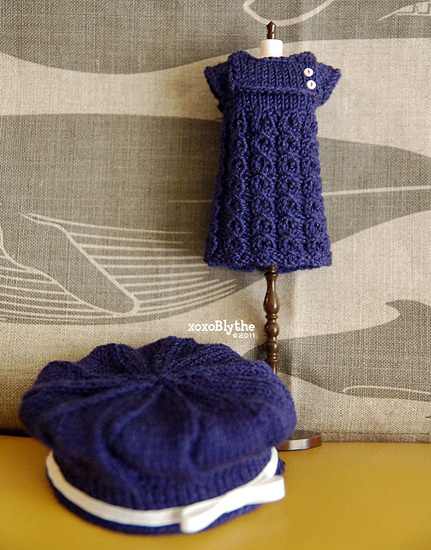 This retro-inspired outfit set is one-of-a-kind, hand-knitted by me to fit Takara/Kenner/Licca-bodied Blythe dolls. Both bonnet & dress are hand-knitted by me, with size 1 needles in a pale cream-colored 100% Peruvian Highland Wool. Delicate lace pattern repeats throughout. The dress is decorated with a red velvet ribbon and a red vintage floral button. Snap closure. 100% of the auction ending amount will be donated to the Red Cross to benefit Japan. Japan is near and dear to my heart, and when I found out my work is doing a 2-for-1 match, I want to raise as much money as I can to help. I am so happy to share this with you guys - I am going to be a vendor at BlytheCon 2011 this June! I will have knitted babydoll tops, dresses, and these really sweet and (of course) vintage-inspired fascinators/hairbands! Made with classy velvet ribbon, craft leaves, and a vintage button from my personal collection, each hairband is lovingly hand-sewn by me, and each is one-of-a-kind. I love these so much and I hope you (and your Blythe girls) will too! I will be offering these exclusively at BlytheCon, and if I have any left, they will go into the Etsy shop. I am so excited about going to BlytheCon and can't wait to meet everyone!